"Spectators on the homestretch will be treated to a noteworthy innovation in the establishment of a depressed official supply stations stretching for 300 feet in front of the grandstand. it will take the form of a pit 10 feet wide and 5 feet deep, and will be reached by a switch from the main course. Here will be kept tires, oil, water and gasoine. The heads of the mechanics will be visible above the edges of the pit. Not only will the passing of supplies and filing of tanks be seen, but the interesting operation of the quick-changing of tires also. " The 1908 rules allowed only the driver and mechanician to work on the car . 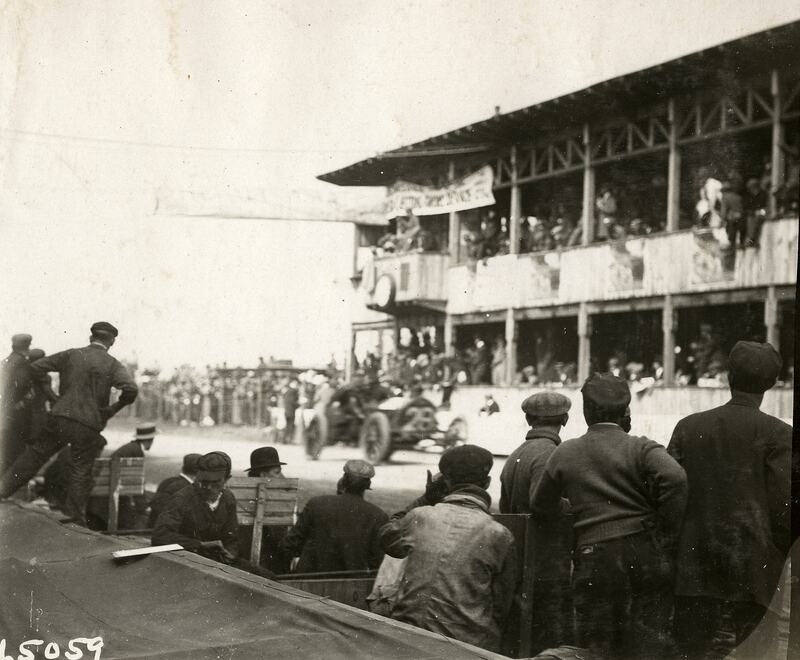 However, the rules were modified in 1910 to allow two of the pit crew to replenish water, oil and fuel and to assist in replacing tires. #2 Lozier (USA) driven by Ralph Mulford. Finished 5th. Completed 22 laps averaging 63.1 MPH. The scoreboard can be seen in the background. 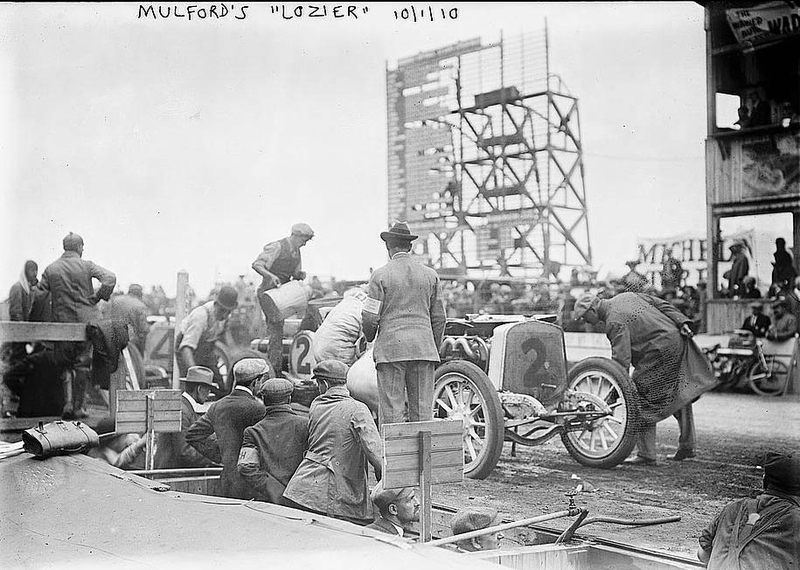 Mulford would win the 1911 Vanderbilt Cup Race in a Lozier. #11 Simplex (USA) driven by Leland Mitchell. Finished 7th. Completed 22 laps averaging 61.30 MPH. Note the pressbox and officials stand. #14 Corbin Cannonball (USA) driven by Joe Matson. Finished 24th. Radiator problems during lap 10. Referee William K. Vanderbilt, Jr. can be seen standing behind the hood. Note the posters hanging on the facade of the press box. 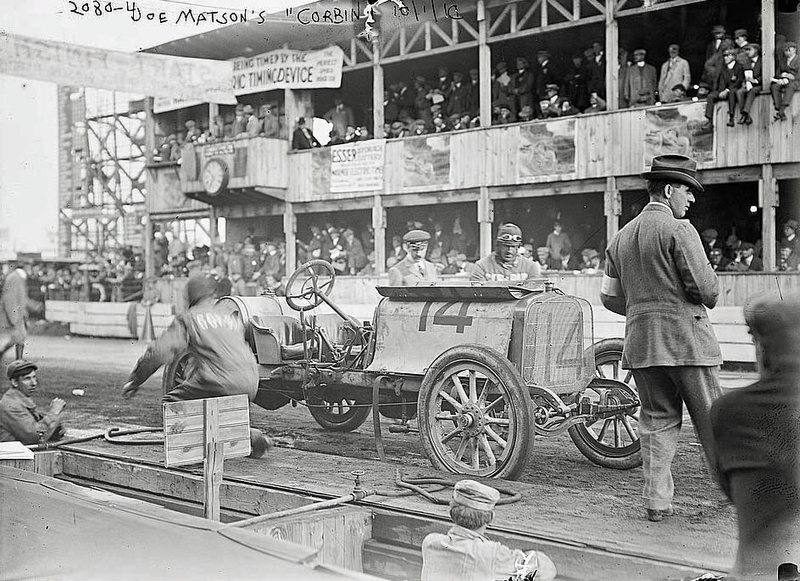 #45 Maxwell driven by Thomas Costello in the 1909 Massapequa Sweepstakes was battling the #16 Benz (Germany) driven by David Bruce-Brown. The Benz finished 12th and was flagged while running during lap 22 when race was called. 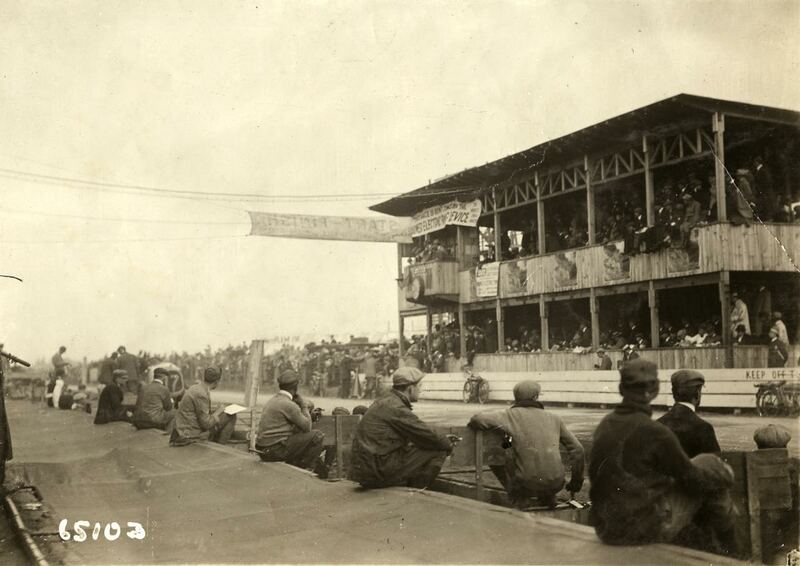 The Maxwell finished 6th in the Sweepstakes which was run simultaneously with the 1910 Vanderbilt Cup Race. On the far left, the #17 Pope-Hartford (USA) can be seen driven by Jack Fleming. Finished 6th. Completed 22 laps averaging 62.5 MPH. #22 Pope-Hartford (USA) driven by Bert Dingley. Finished 10th. Completed 22 laps averaging 59.90 MPH. Note the pit man holding up the #22 sign. 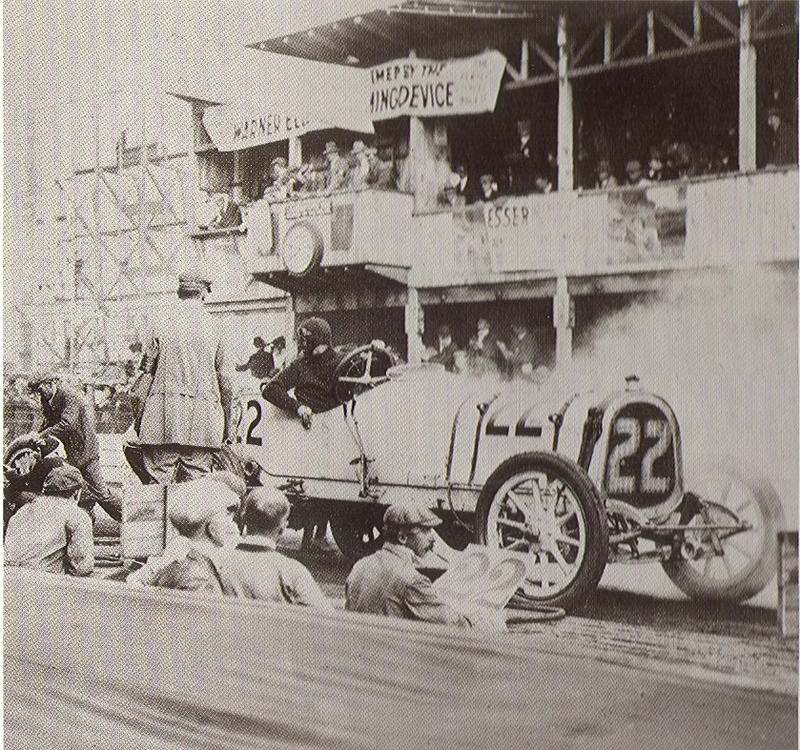 #24 Stoddard-Dayton (USA) driven by Alfred "Tobin" DeHymel. Finished 22nd. Broke steering knuckle during lap 12. Less than two months later, DeHymel would be killed in a racing accident at the San Antonio International Fair Grounds. Great pictures from the pits. 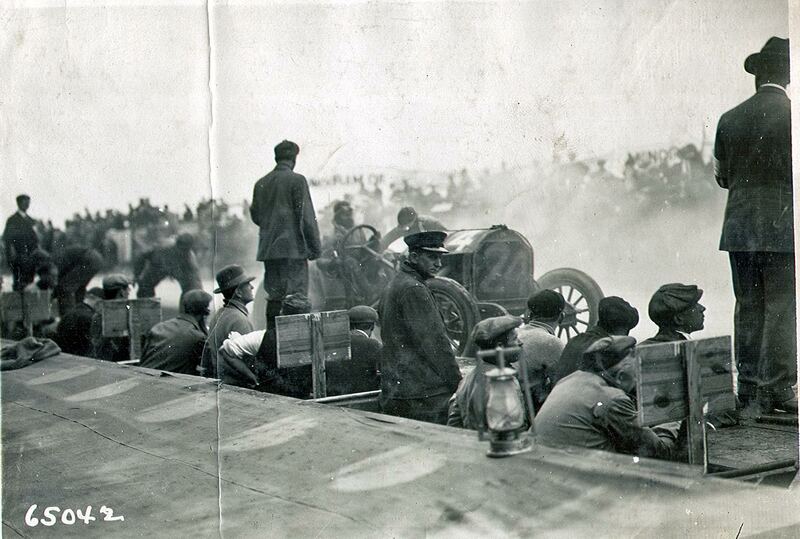 Things look the same from the pits at Lime Rock during vintage races.